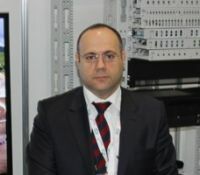 - ­At Bakutel we are representing ASIMETRIK METAL (ASRACK), which has a distributor in the Azerbaijani market. The tasks for the day are to increase sales and find new partners, as well as raising awareness among potential purchasers about our products. ASRACK offers a wide variety of server racks/cabinets – including wall mounted, centralized and compact - and other solutions. In essence, reinforced server racks/cabinets are vital to the creation of local and other networks. Moreover video cameras, radars and domestically produced monitors are available to look at on our stand. Such products have a significant sales market in Azerbaijan.